Passiflora, known as the passion flowers or passion vines, is a genus of about 600 species of flowering plants. 13 passion fruit flower species are native to China, among which nine are found in Yunnan. 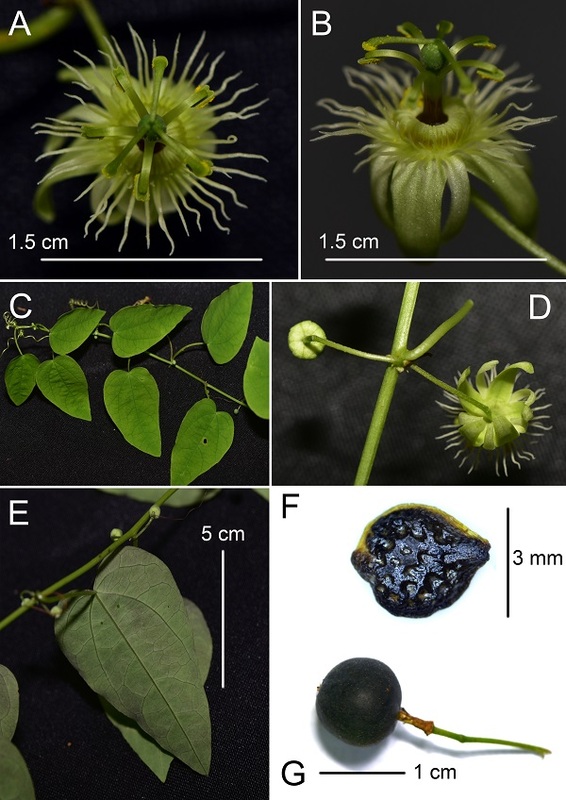 During extensive botanical studies in Xishuangbanna Prefecture in Yunnan, researchers from Xishuangbanna Tropical Botanical Garden (XTBG) collected an unknown species of passion flower in Menghai. After consulting literature and morphological examination, the researchers confirmed that the material represented a new species. They named it as Passiflora menghaiensis referring to its type locality in Menghai County, Xishuangbanna, and got it published in Taiwania. Passiflora menghaiensis is morphologically similar to P. kwangtungensis and P. geminiflora, but can be distinguished by several features. P. menghaiensis has two flowers per inflorescence, the outer series of coronal filaments are white, the inner series of coronal filaments are light green, and the fruit is puberulous. Passiflora menghaiensis is only known from three specimens collected at the type locality (Menghai). Specimens were found in shaded, wet forest openings near a stream, growing in sandy soil. Flowers and mature fruits were observed from late August to early September. There is only one known population of P. menghaiensis in Menghai, Xishuangbanna, Yunnan. All the surrounding forests were surveyed carefully, but no additional populations were identified. Within the single population in Menghai, only six individual plants were observed. Based on the limited population size and restricted distribution of P. menghaiensis, the researchers suggested the new species should be assessed as Critically Endangered (CR).